What Is Personalized Marketing and How Does It Work? Personalized marketing is when you analyze trends with your current customers to create a personalized message for your prospective customers or to upsell existing customers. This type of marketing can sometimes be called individualized or one-to-one marketing. How Does a Personalized Marketing Campaign Work? Examples have shown that personalized marketing is much more efficient at converting prospective customers or leads into customers. One source stated that “Personalized emails deliver six times higher transaction rates, but 70% of brands fail to use them”. There is no special secret to how it works. In fact, it’s really simple. When you have a database of current customers, you should analyze the data to find out if anything sticks out. Are 90% of your customers male? Do 99% of them have children? Are most of them over 65 years old? Those are the sort of things you should look for to find any trends. When you know what the trends are, you can target that exact demographic to create a much more targetted and personalized marketing campaign. There are a few steps you should follow in order to get this right, so let’s dive right into them. This part will likely take the longest, but it is also the most rewarding when you find a pattern. Firstly, take a look at your reporting tools to find out more about your customers. Do you have a CRM or a database where you keep all your customer records? Go through that first and try to find any trends. The best way is to export the data to Excel and delete the sections which might not be relevant, such as customer ID’s. Additionally, you could filter the data to sort it from highest to lowest or A-Z. Because each situation is different, its hard to give you exact instructions on how to try and find patterns in data. Google Analytics is a great place to find out more about your customer demographics. It can give you plenty of information about who visits your website, where they live, whether they are male or female, age group and much more. If you haven’t already, sign up and implement Google Analytics into your website. The data it collects is invaluable. Also, if you’ve used paid advertising from Google or Facebook in the past, you can look through demographics data from those. Check your payment gateway (if you are an online business) for any trends. You can often collect information such as the type of credit cards people are using to make purchases on your website. Are they using Visa and Mastercard, or American Express (AMEX)? 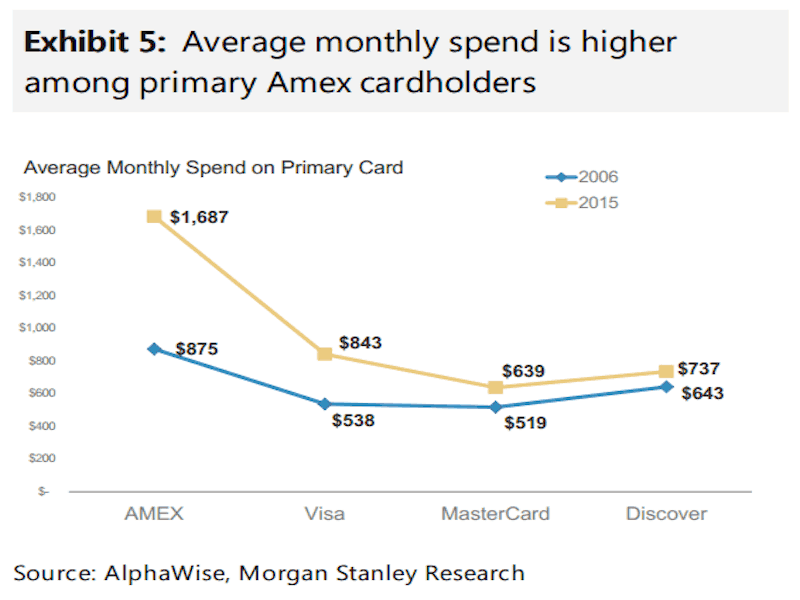 There is evidence suggesting that AMEX users spend more money every month. When you’ve extracted and analyzed the data from all your existing customers, the next step is to build a list of similarities that all your customers share. Sort the trends from highest to lowest, and start working from the top. Let’s do an example of a website that sells sneakers. 75% of customers were between ages 25-35. 70% of customers used an iPhone to make a purchase. 65% of customers are male. 40% of customers live in Texas, US. The remaining 60% were spread around the world. In this case, it’s quite clear that we should create a personalized marketing campaign for Texan males who are between 25-35 years old and use iPhones. Next, build a list of your current customers that fit the bill. Save their email addresses so you can create an email campaign for them. Although you can use your new data to try and upsell your existing customers using a personalized message, you can also use it to create a lookalike marketing campaign on Google Adwords or Facebook to attract new customers. A lookalike marketing campaign is basically telling Google and Facebook about your customer demographics, which they then use to only show advertisements to lookalike audiences (other people who meet those demographics you specify). Emailing lost customers that meet your criteria with a personalized message. Engaging with existing customers to try and get them to sign up to a higher plan, or buy more products, using a personalized message via email. Emailing customers that abandoned at checkout, or that almost became a customer to convince them to convert with a personalized message. Using Facebook or Google Adwords to create a lookalike audience list and targetting your ads to them using a personalized message. Using Social Media to create personalized posts that your followers can relate to. Adding a banner to your email signature with a personalized message. If we use the above example in point #2, Facebook would certainly be a great way to market to your target audience. Our target audience is males between 25-35 years old. 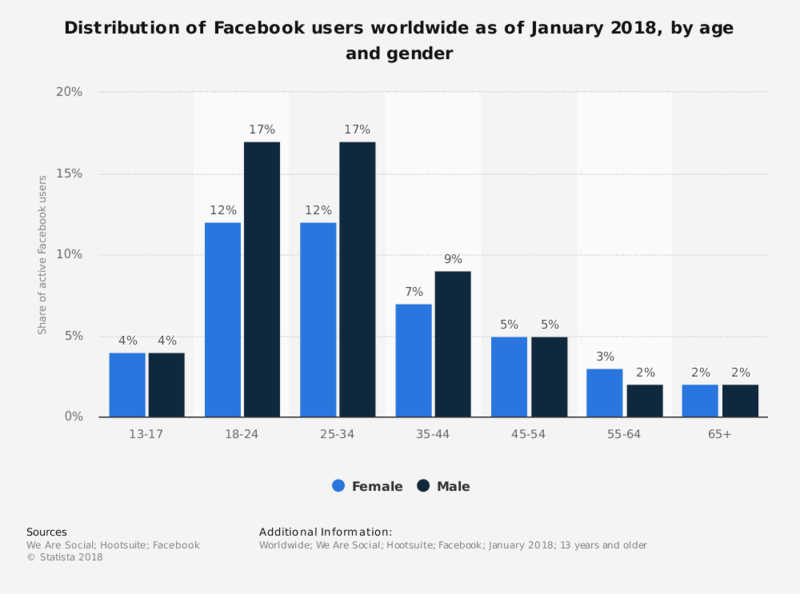 Facebook’s largest percentage of users are males aged between 25-34. This is a great fit! There are plenty of ways to make a great marketing message. You could use images, wording, or a combination of both. If your target audience likes art or design, you would be silly not to have some images in the message. Keep in mind if you are using Facebook or Google Adwords for your ads, you will have character restrictions, so use the real estate wisely! Using the above example from point #2, let’s take a look at what sort of advertisement we could create. Since you know your target market is males that live in America that are 25-35 years old, you could use American slang in your marketing message to connect with your customers better. You would also ensure that your message is optimized for iPhones. It takes a long time to master personalized marketing. Furthermore, that’s why it’s important to track your performance and make adjustments as needed. For a Google Adwords, Facebook or email based campaign, you could track the CTR (Click Through Ratio) for a link you placed in the marketing message. In brief, there are many metrics you can track to analyze the campaign’s performance. MailChimp – Used for creating email marketing campaigns. 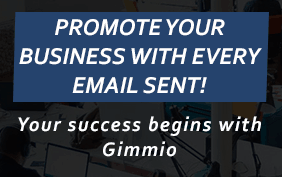 Gimmio – Use it to insert email signature banners with a personalized message into your email signature. Facebook – For creating ads for lookalike users or for using your company page to market to your existing customers. Google – Using Google’s Adwords, you will be able to place your ads on display networks that are in your niche. Hootsuite – Use Hootsuite to manage your social media profiles to get your message across all of them consistently. 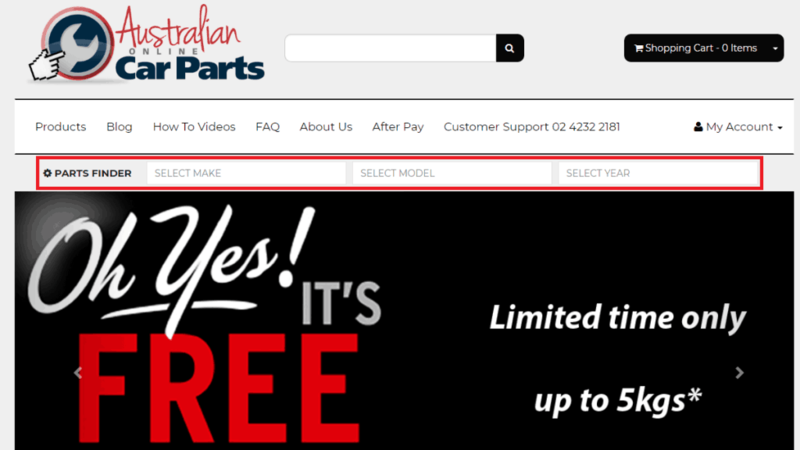 Take a look at this example from Australian Online Car Parts. At the top of the page, they get you to fill out your car make, model and year to find your car parts easier. In summary, this gives them information on how to personalize their marketing towards you. Very smart move! This example from Google is perfect. They send this email to any account that isn’t signed up to Google Adwords and tell you that people are searching for you. 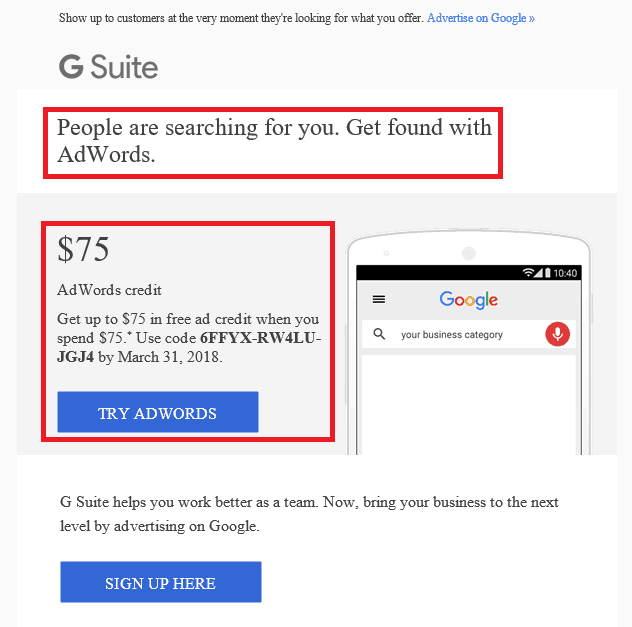 They also give you a $75 Adwords credit with a link to sign up. 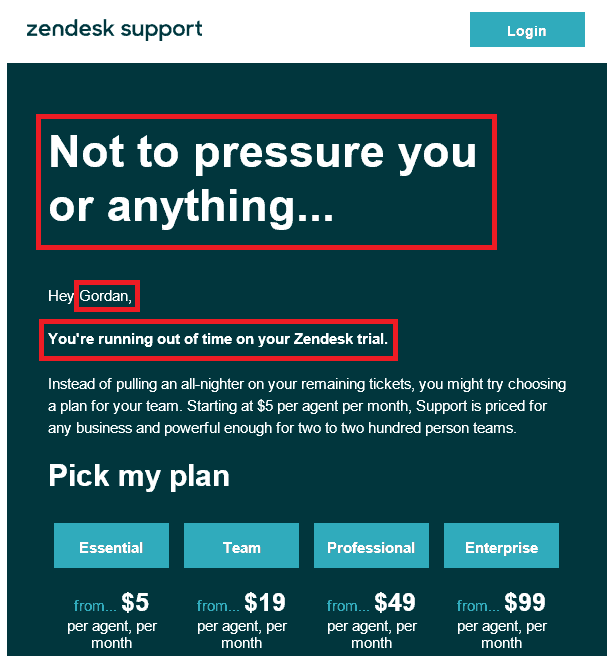 The last example is from Zendesk. This email was sent as the trial period was nearing the end, and they wanted to remind you to subscribe to a paid plan.